Juniper Berries. There are lots of different trees in the Juniper (Juniperus) family. There are three native Junipers that I know of in the Eastern part of North America, the Common Juniper (Juniperus communis), the Creeping Juniper (Juniperus horizontalis) and a tree called the Eastern Red Cedar (Juniperus virginiana). 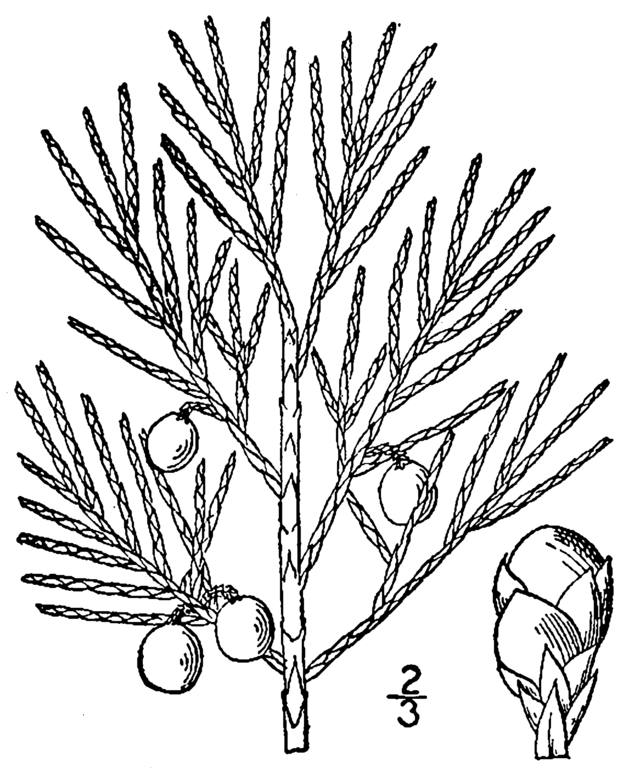 It is oddly called a Cedar, even though it is not a Cedar, but a Juniper. Very commonly found in nurseries for sale is the Chinese Juniper (Juniperus chinensis) and hybrids of it with other Junipers. Because of this, this one is commonly found in yards in cities. Hybrids of the Eastern Red Cedar (Juniperus virginiana) and the Creeping Juniper (Juniperus horizontalis) can be found in Southern Ontario on sandy and rocky sites that get harsh winter winds, such as near lakes. 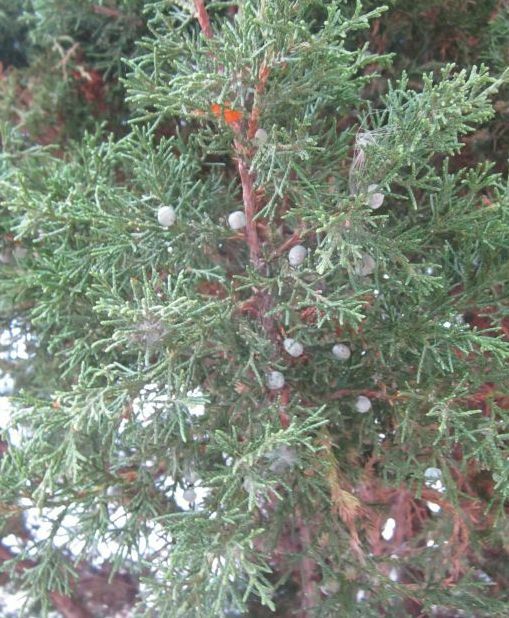 Caution: Do not use the European Juniperus sabina and Juniperus oxycedrus for food at all. They are sold at nurseries, and the berries are not edible. 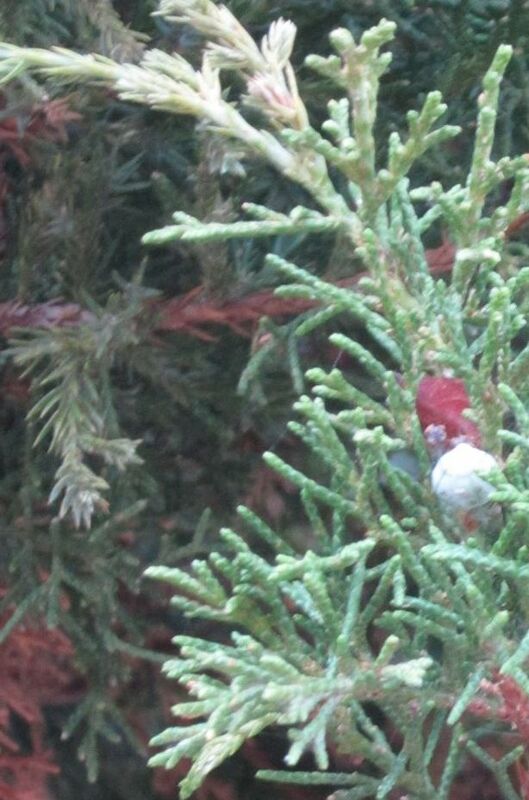 Also, do not use berries from the commonly sold hybrid known as the Pfitzer Juniper (Juniperus × pfitzeriana). I also strongly suggest not using the Eastern Red Cedar (Juniperus virginiana) and any of its hybrids, though Native Americans did use this one, there is the possibility the seeds are slightly toxic. I only can recommend three, though there are others that are said to be safe to eat. The three are: Common Juniper (Juniperus communis), the Creeping Juniper (Juniperus horizontalis) and the Chinese Juniper (Juniperus chinensis). The first choice is the Common Juniper (Juniperus communis). Transplanting: If you live where they grow, just transplant a small one - make sure you identify it before you move it. If you find a big one, look around and you should find many small ones. If you get one that is 30 cm (1 foot) or smaller, they transplant very well. If you don't have any around, you can buy the Chinese Juniper or Creeping Juniper. If you are buying a Juniper at a nursery, and plan on using the berries, make sure you get one of the three recommended ones only. Seeds: They can be started by seed, but transplanting a little one is a much better way to go. If you find a tree with berries, in most cases you can find little ones around. The trees take a long time to get to around 30 cm (1 foot) high, and ones that size transplant with ease. Planting: There are no special requirements for this one. As with most trees, open loamy soil that is moist and drains well will provide a better growing environment. Dig the hole, mix in some peat moss and a little compost or composted manure, plant the tree, cover with the soil from the hole and mulch. Water when it gets dry for the first year. Maintenance: Not much has to be done. Trim to shape any time of the growing season, fertilize with a conifer pellet fertilizer if you want it to grow faster, mulch a little around it, but that is about it. Even if you ignore it, and provide it with poor conditions, it will usually grow, just slowly. Harvesting: These berries take more than one year to ripen, so try to get the second year ones. They can look a little shrivelled. Taste and pick what appeals to you. If you get the firm looking first year ones in the fall, the flavor is a little weak. In general, the best time to harvest is in the fall, but often they can be found all year long and are fine to harvest some. 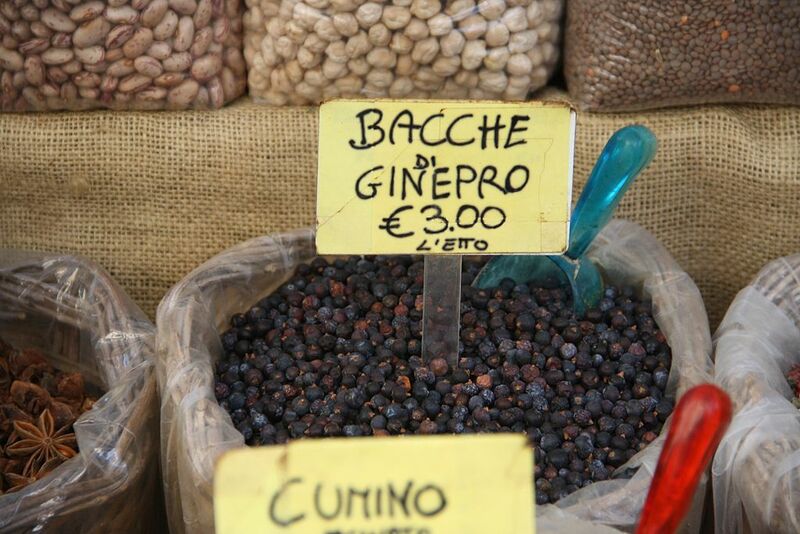 You can dry them for using later - a pepper grinder works good for grinding up the dried berries. But, that said, I much prefer them fresh, and the nice thing about having a tree in the yard is you can go harvest half a dozen berries and use right away. 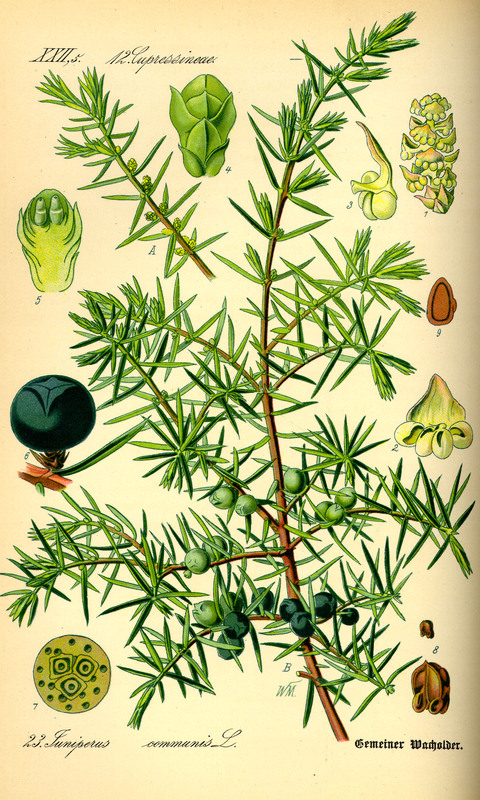 Using: Juniper berries from the Common Juniper are used to flavor Gin, some beers and are used as the spice for sauces for foods. This is not a berry to make a meal of, just eat a couple at a time or use a few for flavoring sauces. Often you will read they are too strong to eat raw, I don't feel that way. My first choice is the Common Juniper, with the Chinese Juniper being a second. Crush the fresh berries well, or grind the dried ones. USDA distribution map and plant profile for all Junipers in North America here. 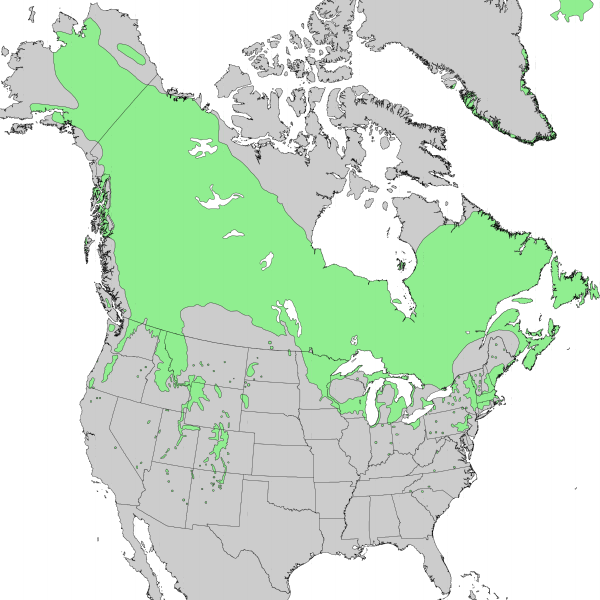 The Biota of North America Program (BONAP) distribution map of all Junipers in North America here. BONAP map color key here. I don't think this would be easy to find at a nursery, but some might carry it. 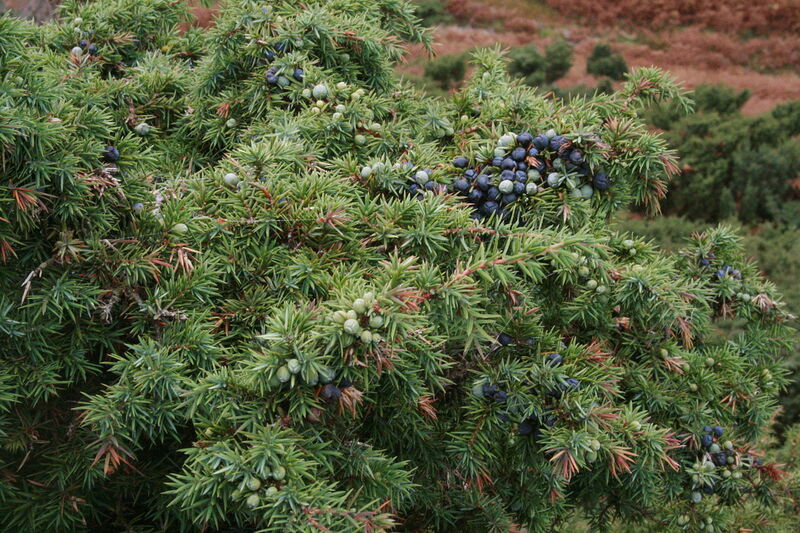 The Chinese Juniper and hybrids of it are the most common. If you live where this tree grows, you should be able to find very small baby Common Junipers around and transplant one or two. I find they transplant very easily when young. When you find a mature one, just wander around it, as there are sure to be little ones. Pictures of the Common Juniper on the web here (Google images) and here (Bing images). 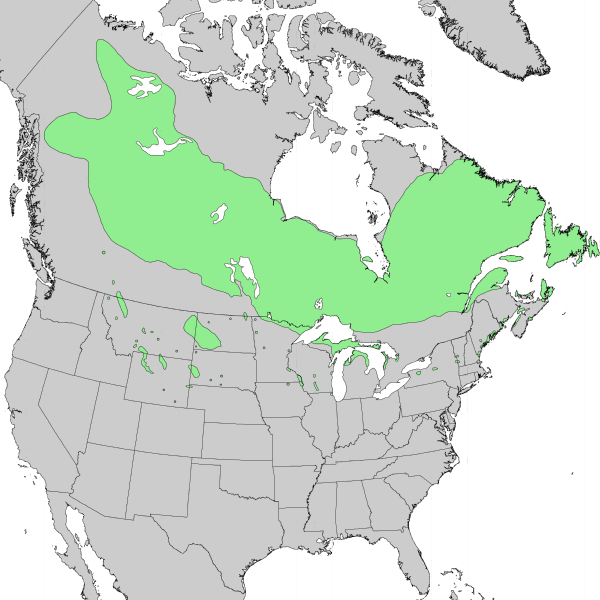 Common Juniper (Juniperus communis) range. Distribution map courtesy of the USGS Geosciences and Environmental Change Science Center, originally from "Atlas of United States Trees" by Elbert L. Little, Jr. . Creeping Juniper (Juniperus horizontalis). Also known as the Creeping Cedar. This one, and hybrids of it are sold at nurseries for rock gardens and ground cover type shrubs. If you are going to transplant or buy one for eating the berries, you have to make sure it is not a hybrid with one of the poisonous ones. Leaf Notes: Leaves on adult specimens grow like the adult leaves on the Chinese Juniper and Cedar tree leaves. New growth has a blue hue, while older leaves seem more green. There are cultivars that have colors that are not typical of what you would find in the wild - yellowish, green and variegated. 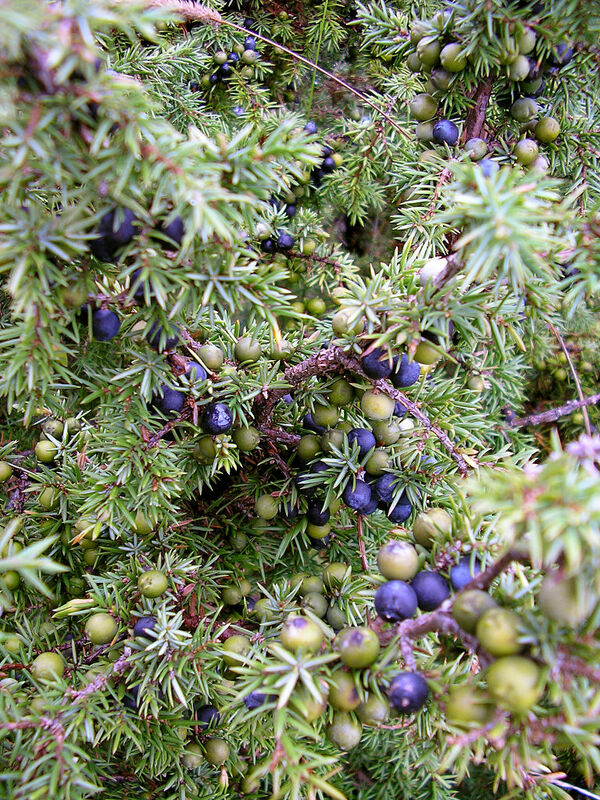 Pictures of the Creeping Juniper on the web here (Google images) and here (Bing images). Creeping Juniper (Juniperus horizontalis) range. Distribution map courtesy of the USGS Geosciences and Environmental Change Science Center, originally from "Atlas of United States Trees" by Elbert L. Little, Jr. .
Chinese Juniper (Juniperus chinensis). There are many cultivars and hybrids with this one and others, so keep that in mind with the description. For the most part, if you find a Juniper that was planted in the city, it has both kinds of leaves (scale like and spike like), you probably have this one, or a hybrid with it another - often a toxic one. If you are buying this one for eating the berries, make very sure it is not a hybrid. The Pfitzer Juniper (Juniperus × pfitzeriana) is a very commonly sold hybrid, and the Juniper it is crossed with (Juniperus sabina) is toxic. Leaf Notes: Although after the first few years of the tree, the leaves change from the juvenile to mature type, very often in shaded parts of the inner branches there will still be some juvenile type leaves growing. Habitat: In Eastern North America, will be found as landscape trees in city parks and private yards. Probably naturalized in North America, but I have not found specimens in the wild myself. Pictures of the Chinese on the web here (Google images) and here (Bing images). This is a Chinese Juniper (Juniperus chinensis). This is a typical city landscape use Juniper. 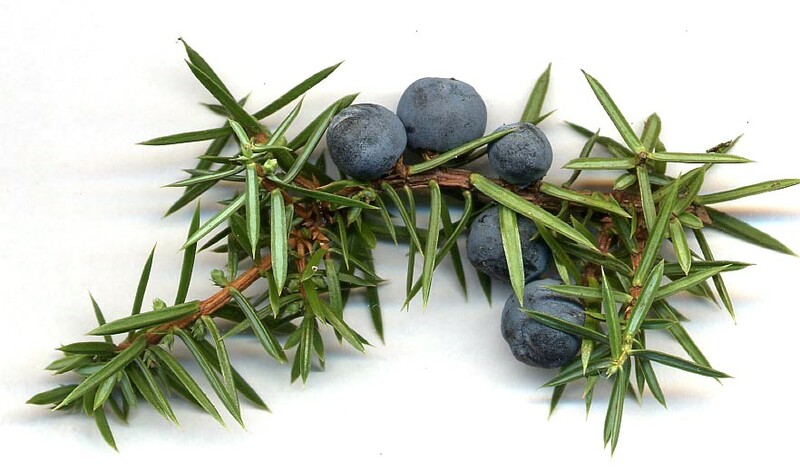 The blueish, spherical “berries” look basically the same on the native Common Juniper. This picture shows a tree with both shapes of leaves on the Chinese Juniper (Juniperus chinensis). The leaves that are close with the berry in the center look like White Cedar leaves with a blue hue. But look on the very left side of the picture half way up. You can see the other kind of leaf that looks like individual “spikes” on a center stem. These spikey leaves are often called juvenile leaves, but persist into older trees in shaded areas of the tree - usually nearer the trunk.